‘Swedes will compare this to the Holocaust’, The Local, 20 April 2015. What’s wrong with the Swedes — and so many other Whites?, by Kevin MacDonald, 25 April 2015. Sweden’s asylum offer to refugees from Syria, BBC News, 23 October 2013. The Psychological Mechanism of White Dispossession, Kevin MacDonald, YouTube. Swedish Journalist Blamed Jews for anti-Semitism, Israeli Ambassador Wins the Day, The Jewish Press, 18 February 2015. Nigel Farage says only middle-class white people think UKIP is racist, Daily Mail Online, 24 April 2015. Green candidate in hot water over tweets suggesting Nigel Farage ’emulates’ Hitler, Manchester Evening News, 25 March 2015. Conservative candidate makes vile Jewish racist slur against Ed Miliband, Mirror Online, 26 April 2015. 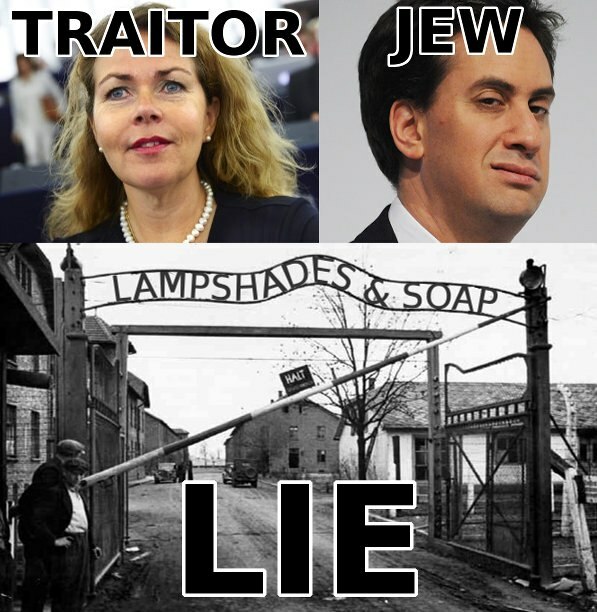 Ed Miliband uses Holocaust Memorial Day to call for vigilance against the terrible roots of prejudice, Mirror Online, 27 January 2015. The Realist Report: Top Jewish leader claims entire Western world culpable for “Holocaust”, John Friend, 26 April 2015. For years thousands of Africans and other non-Whites have been invading Europe, crossing the Mediterranean ocean by boat. Rather than turning these boats around, or simply sinking these invaders, European security forces, ostensibly sworn to protect their countries from invasion, have been increasingly more likely to “rescue” the invaders, to help them ashore, feed them, and release them to do as they please in Europe. 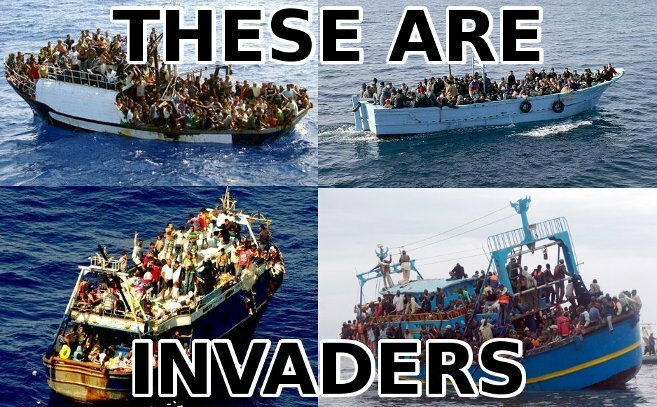 Why do European governments permit this invasion? I’m sure the details of the incidents and legal arguments are complicated and confusing. But to put it simply, it happens for the simple reason that the invaders aren’t offically regarded as invaders, but instead are described as innocent victims, “refugees” who are just looking for a better life for themselves and their families. And the simple reason for that is treason. The governments are operated by aliens and indigenous traitors who demonstrate by their words and deeds that they place the interests of alien invaders above the indigenous Europeans. UN expert: rich countries must take in 1 million refugees to stop boat deaths, The Guardian, 22 April 2015.
the Hans & Tamar Oppenheimer Professor in Public International Law at the Faculty of Law of McGill University. In 2011, he was appointed United Nations Special Rapporteur on the Human Rights of Migrants. UN Rapporteur Francois Crepeau Has A Very Rude Word To Describe UK’s Attitude To Migrants, Huffington Post, 12 March 2014. The only real solution to Europe’s migrant crisis is to let everyone in, by Dylan Matthews at Vox, 21 April 2015. VOX’s Dylan Matthews: Ending Europe Forever Is The “Only” Solution To Migrant Crisis, by James Kirkpatrick at VDare, 22 April 2015. A Swedish MEP [Cecilia Wikström] is stepping up a pan-European cross-party campaign for “legal and safe routes to Europe” for migrants in the wake of the latest Mediterranean boat disaster. I think that my children and grandchildren are going to ask why more wasn’t done to help people running away from Isis, or violence in Eritrea or wherever, when we knew that people were dying in their thousands. People will ask the same question they did after the war, ‘if you were aware, why didn’t you do something?’. In Sweden we allowed our railroads to be used to transfer Jews to Nazi death camps. Will Africa’s Northern Sea be the Mediterranean or the Baltic?, by Steve Sailer, 23 April 2015. Swedish navy widens search for mystery submarine, Associated Press, 20 October 2014. 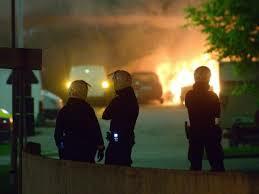 Faced by another night of terror at the hands of predominantly immigrant rioters, Swedes grown tired of the police’s inability to put an end to the unrest took to the streets Friday night to defend their neighborhoods. The decision to round up vigilantes while, according to Stockholm Chief of Police Mats Löfving, ”doing as little as possible” to stop rioters, met with a wave of protests in various social media and on the Internet. Representatives of some vigilante groups contacted Fria Tider to give their view of last night’s events. – It makes me sick to see the police clamp down on us Swedes with full force and without warning, using nightsticks and tear gas, while they don’t do a damn thing about the immigrants. We are only trying to help maintain order, while the immigrants set cars and buildings on fire, said a young man who wished to remain anonymous. Western jewsmedia accounts are more or less biased against the Swedes and in favor of the aliens – blaming Swedes for being too unwelcoming and unaccomodating to the poor, victimized aliens who are only violent because they want a better life for themselves and their needy families. In contrast this Fria Tider report comes across as almost fair, giving voice to Swedes who are justifiably sickened by a government which won’t actively defend the Swedes from aliens but will actively defend aliens from the Swedes. Vigilantes now confirmed (at nordfront.se). 400 nationalists defended Stockholm-beat down invandrarpöbeln (at nationell.nu). Note also The Jewish origins of multiculturalism in Sweden, at The Occidental Observer. The alien interlopers don’t belong in Sweden. Sweden is for the Swedes.